Of this officer corps, 319 were professional officers, educated at the United States Military Academy at West Point, New York; 194 of these remained loyal to the Union seeing active service in opposition to their Southern Brethren. Many others came from civil professions; lawyers, businessmen, farmers, teachers, doctors and ministers, and yes, even politicians. During the four years of warfare between the North and the South, 583 individuals attained the rank of general officer and an additional 1,367 had been brevetted as the same. All of these wore the rank of either a brigadier or major general. The Union Armies had not re-established the rank of Lieutenant General until February of 1864, when for the first time since George Washington that rank was bestowed upon Ulysses S. Grant as General in Chief of the Armies of the United States in March of that year. 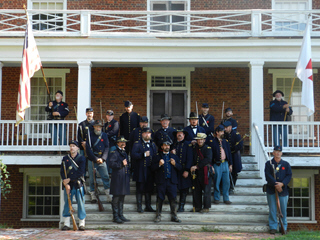 The American Civil War would produce some of the most fascinating chapters in our nation’s history, and some of the largest armies the world had ever seen would close up behind and be lead into harm’s way by many whom you’ll be honored to meet, characters and personalities recreated through the first person historical characterizations of these our "Lincoln’s Generals". "We are people to whom the past is forever speaking.